An estimated 660,000 Texans aren’t aware they have diabetes, and far more don’t know just how at risk they are for the disease. Prediabetes means that your blood sugar level is higher than normal, but not yet high enough to be Type 2 diabetes. Your pancreas is unable to make enough insulin to completely normalize your blood sugars. The condition has no symptoms. Researchers at the University of Texas at Dallas have built a small, inexpensive sensor they say can tip you off if you're at risk for Type 2 diabetes — the world's leading cause of amputations, blindness and kidney failure. Over the past month, Baylor Scott & White Health has been distributing free diabetic shoes to its uninsured, low-income patients to combat and prevent what doctors see as a diabetes crisis in North Texas. The shoe distribution is just one part of a Baylor program that takes its own medical surplus and gives them to the needy at home and abroad. An innovative program from Baylor Health Care System and the City of Dallas has been taking on diabetes with common sense. The fix is as simple as fresh fruits and vegetables. A study published in 2015 found more than half of American adults had diabetes or pre-diabetes in 2012. Managing the disease usually involves medication, especially insulin. But exercise can also be effective - even preventive at times. KERA looks at real-life health issues in our series, Vital Signs. In this edition: all that rich or sweet food we tend eat more of at holiday time. A large number of patients at Dallas County’s Parkland Hospital System have Type 2 Diabetes. Unlike Type 1, Type 2 Diabetes doesn’t require insulin injections – at least not right away – but it’s just as serious if it’s not managed properly. In Dallas, the Tom Landry Triathlon will be held this weekend--it’s 400 meters of swimming, 15 miles of biking, and then 3 miles of running. Among the athletes at the starting line on Saturday will be a group of middle schoolers from South Dallas. 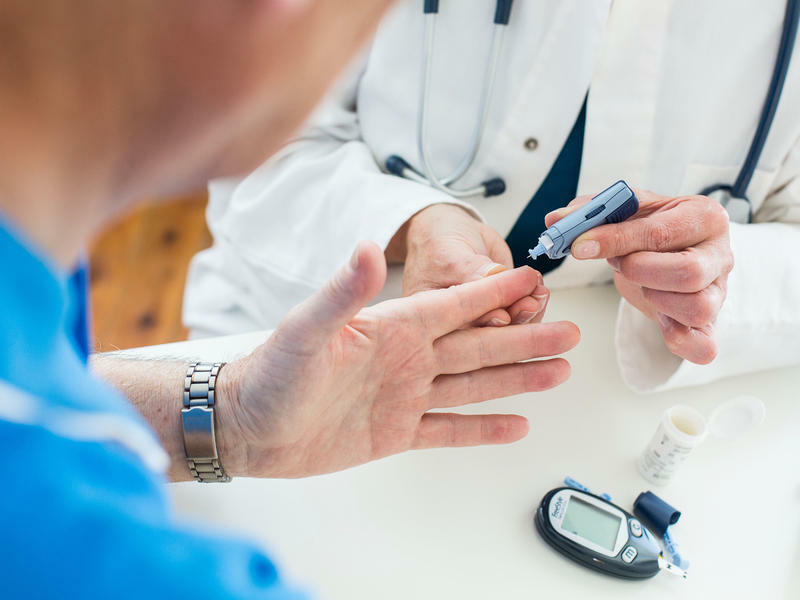 If you don’t manage it carefully, diabetes can lead to several complications, including damage to the eyes. The most common form is also is one of the leading causes of blindness among adults in the U-S. In our consumer health series, Vital Signs, Dr. Noel Santini, chief of Adult Medicine for Parkland Hospital’s Community Medicine Division, explains why regular screenings are key to dealing with diabetic retinopathy. Researchers have found people diagnosed with diabetes in their 50s are significantly more likely than others to suffer mental decline by their 70s. In this week’s Vital Signs, Dr. Angela Bentle, a geriatrics and internal medicine specialist with Methodist Charlton Medical Center, explains why this seems to occur in middle age than with younger people. While we all look forward to the holiday feast, people living with diabetes have to exercise caution. In this week’s Vital Signs, Sharon Cox, a dietitian with Parkland Hospital System, talks about ways to keep blood sugar levels stable. They need insulin to survive, but some Type 1 diabetics will take less or none at all to avoid weight gain. One factor contributing to obesity and diseases like diabetes is portion distortion. The belief that the larger portions on today’s menus and shelves are normal and the size we should always consume. In this edition of Vital Signs, dietitian Jamie Bass, a dietitian with Texas Health Harris Methodist Southwest Fort Worth explains the difference. Artificial Sweeteners: Bad For Your Blood Sugar? Many use artificial sweeteners to avoid weight gain or to fight diabetes. But new research suggests the opposite effect. A study published in the journal Nature shows the impact of artificial sweeteners on gut bacteria can raise blood sugar levels and contribute to obesity and diabetes. Dr. Luis Meneghini heads the Global Diabetes Program for Parkland Hospital System. In this edition of Vital Signs, he talked about the potential of the results. Despite prenatal care, around five percent of women will develop diabetes during pregnancy. Gestational diabetes is a temporary, but potentially serious problem. In this edition of Vital Signs, Dr. Brian Casey, an obstetrician with Parkland Hospital, explains gestational diabetes is part of the physiology of pregnancy. Vital Signs: Is Alcohol Ever Good For You? Dr. Glenn Hardesty, an emergency physician at Texas Health Arlington Hospital, says there are far more risks from consuming alcohol, but there can be a few benefits from moderate drinking. Vital Signs: Possible Help For Those With Type 2 Diabetes? Researchers at UT Southwestern Medical Center have targeted another possible way to control high blood sugar for the 25 million Americans with Type 2 Diabetes. The discovery occurred amid research into people born without fat, and why such people develop health problems associated with fat such as diabetes. People living in one South Dallas neighborhood used to be three times as likely to die from diabetes-related complications than those in Dallas County overall. That grim statistic is changing, thanks to a prevention-focused health center at the Juanita J. Craft Institute. Actor Tom Hanks recently revealed he has the most common form of diabetes – type 2. Those with type 2 diabetes don’t properly use insulin, which is needed to absorb sugar and starches in the blood. Hanks has attributed the disease to both lifestyle choices and genetics. In the latest installment of KERA’s Vital Signs, Dr. Saleemah Fahmi, an endocrinologist at Methodist Charlton Medical Center, explains how those factors impact the disease. You can treat diabetes, but you have to know you have it. About a quarter of Texas adults have diabetes, but many are never diagnosed. The Diabetes Prevention and Control Alliance and the YMCA of are sponsoring “Seniors Tell Diabetes Not Me” week and are hosting several free diabetes prevention awareness events in the Dallas-Fort Worth area between June 17th and June 22nd. Researchers have known that having diabetes raises a person's risk of dying, but now there is a simple tool to calculate which diabetic patients are at the greatest risk. With Type-2 diabetes, the body’s ability to produce needed insulin declines. Doctors often recommend lifestyle changes and the drug metformin after an early diagnosis. But an eight year study by U.T. Southwestern Medical Center has found early intensive treatment of insulin and a drug regimen may be a better strategy. In a KERA Health Checkup, the author of the study, Dr. Ildiko Lingvay, talks about the results.